Pave Cut concrete is a great new way to create that clean paved look. 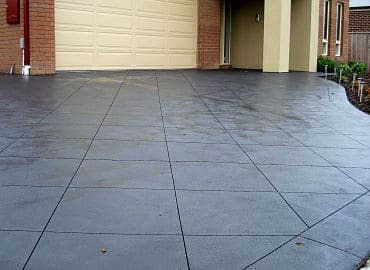 This modern style is visually attractive and has many benefits that paving doesn’t offer. What Type of Concrete can be Pave-Cut? The best results are achieved with plain, coloured concrete or exposed aggregate. Do I have a Choice of Design? Absolutely! We can cut designs including diamonds, squares and even borders – this is completely customisable – ask our team what they might recommend for your home. I had been recommended from a friend that 1300 Driveway do a good job. The Quote was prompt. I asked for a few changes to the quote and they responded quickly. I reviewed there samples and chose the texture and colour we liked. We then accepted the quote and they came back with a tentative date for installation. Due to cancellation they moved the work forward and the job was started. Within a day the ground was prepared with the levelling and framing completed. We ran into a problem with the weather as it would not stop raining. The first clear day they pored the driveway and levelled. A day later they pressure washed the driveway and cleansed up. We had to wait for two days for the rain to stop they then coated the top. Looks fantastic, the neighbours have commented a number of time. Thanks 1300 Driveways -fantastic job.